A round-up of global news while you were sleeping and upcoming events for the day, as seen in our daily newsletter for Monday, 28 May 2012. The UN Security Council condemned the Syrian government, in the “strongest possible terms”, for the massacre of 116 people in the town of Houla. Nearly 50 children were among the casualties, that saw government forces unleash heavy artillery on the residential area on Friday. In a rare public statement, Israel joined the USA and Britain in condemning the attacks, which President Bashar al-Assad’s spokespeople have termed a “tsunami of lies” against his administration. Lloyds of London are preparing for Grexit (Greece’s exit from the euro zone) by reducing its exposure to the region by “as much as possible”. Lloyd’s have put in place a plan to switch to multi-currency underwriting, should the euro zone break-up, causing a £60-billion investment write-down for the insurer alone. IMF Chief, Christine Lagarde, won’t be breaking plates and sipping ouzo anytime soon after the backlash of her statements made on Friday where she suggested Greeks had avoided paying their taxes and that it was now payback time. Greek politicians were up in arms at the insinuations, claiming that Lagarde had insulted the Greek people and that the truth really does hurt. Tropical storm Beryl was nearing Hurricane status as it approached the states of Florida, Georgia and South Carolina dumping several inches of rain and bringing Port Elizabeth-strength winds with it. Flights and ferry services have been cancelled ahead of the holiday today, after storm warnings were issued. Ironically, many areas in the expected flight path of the storm are experiencing severe drought and are in dire need of the rainfall, proving it never rains but it well, you know, pours. Jacques Kallis helped Kolkata Knight Riders lift their maiden IPL championship trophy in a thrilling final in Chennai. Set an imposing target of 191 to win by the home-team, Chennai Super Kings, Kallis shared in a 136-run second wicket partnership with Manvinder Bisla to guide KKR to the win by 5 wickets and two balls to spare. The final was a fine advertisement for the shorter format of the game and an opportunity for King Kallis to shove humble pie down the throat of critics who said he couldn’t adapt his game to the demands of high-scoring T20 play. Kallis scored 69 runs off just 49 balls. How do you like them apples? The second major tennis tournament of the year kicked-off on the red clay courts of Roland Garros yesterday. Andy Roddick and Jurgen Melzer were the highest seeded men’s casualties on Day 1 with no scares on the women’s side of the draw, besides some of the grunting sounds from centre court. South Africa’s Kevin Anderson was locked in a five-set thriller at 7-7, with Rui Machado of Portugal, when poor light stopped play in Paris. In case you’ve been hiding under a rock for the last two weeks, a little court hearing about a big spear continues at the South Gauteng High Court. In a case that has hogged the South African media limelight with more twist and turns than a Beyonce perm, the ANC continues in its quest to have the painting and all its reproduced images declared unlawful, even though it has already been splashed across the pages of the interwebs. Expect more wailing, condemnation of the media and unexpected nervous break-downs. A host of Pulitzer prize winners will be announced today in New York. The awards honour achievements in newspaper and online journalism, literature and musical composition. Established in 1917 by Hungarian immigrant and publisher, Joseph Pulitzer, the awards are administered by Columbia University in 21 categories ranging from breaking news to music and poetry. It’s Memorial Day today in the USA, a federal holiday honouring American soldiers. Formerly known as Decoration Day, it began after the American Civil War to commemorate the fallen Union soldiers but has now being extended to honour all fallen American soldiers. The celebrations come against the backdrop of anti-war sentiment held by a third of post 9/11 war veterans who feel the Afghanistan and Iraqi wars “were not worth the cost”. South Africa’s successful bid to host the lion’s share of the Square Kilometre Array is an incredible achievement and cause for celebration. But a political phantom has lurked over the decision to split the ambitious project between the bidding nations. ALEX ELISEEV goes backstage in search of the illusive compromise. As the National House of Traditional Leaders lobbies for gay rights to be excised from the Constitution, and the chair of the Constitutional Review Committee sprouts anti-gay statements, lesbians and gays continue to be subject to violent attacks. MANDY DE WAAL speaks to constitutional law professor Pierre de Vos about human rights and irresponsible politicians who fuel homophobic hate in South Africa. Subscribe to our First Thing morning e-mail here. 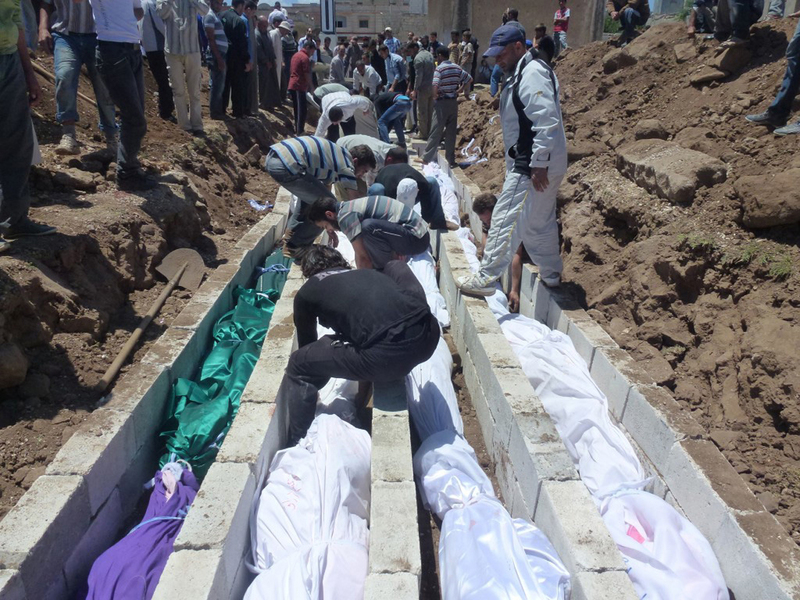 Photo: People gather at a mass burial for the victims purportedly killed during an artillery barrage from Syrian forces in Houla in this handout image dated May 26, 2012. REUTERS/Shaam News Network/Handout.